Summer is just around the corner and it is time to wear some lovely colourful footwear. 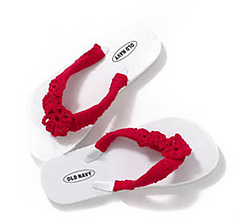 Why not try some Crochet Flip Flops. Lovely Colours, patterns and the comfort it provides is awesome, isn’t it??? So let us see what all patterns we have for you which will be absolutely Free. 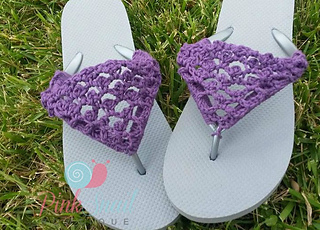 Peekaboo Picot Flip Flops by Pink Snail Boutique is a lovely one made using Aran weight yarn, 4.00mm, and a 5.00mm crochet hook. Bloom Flip Flops by Nerissa Muijs is a nice one made using Worsted weight yarn and a 5.00mm crochet hook. Tranquil Triangles Flip Flop Flair by Lisa Jelle is a lovely one made using a DK weight yarn and a 5.00mm crochet hook. Fantabulous Flip Flops by Lion Brand Yarn is a sweet and simple one made using Sport weight yarn and a 5.00mm crochet hook. Crochet Flip Flops with Ruffle Yarn, Pom Pom Yarn, Fun Fur and Beads by Naztazia by using a thread and 3.75mm crochet hook.